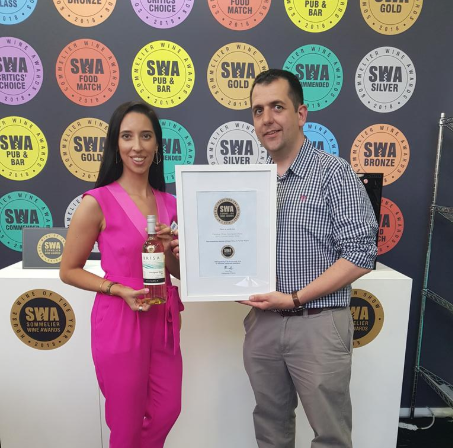 Micaela Martins Ferreira – Deputy Competition Director at Sommelier Wine Awards with Pete Fairclough of Kingsland Drinks, Vistamar’s UK distributor, accepting the House Wine of the Year Award. Vistamar’s Brisa Sauvignon Blanc has been named House Wine of the Year at the 2018 Sommelier Wine Awards earlier this week. Distributed in the UK by Kingsland Drinks, this Sauvignon Blanc, which sells in the trade for £3.77 DPD per bottle, is produced in Chile’s Central Valley, and has received critical acclaim from the UK’s top sommeliers. SWA Judge Sahar Gharai of La Dolce Vita Wine Lounge (California), said that this Gold medal Sauvignon Blanc was ‘great for the price’ and described a wine that was ‘well-balanced – floral and aromatic, with some good citrus notes’, while SWA team leader Angela Reddin had good things to say about its ‘bright, fresh nose containing red apple and some citrus character’, going on to praise it for being ‘fresh and light in the mouth’. The Sommelier Wine Awards is the UK’s only on-trade wine competition. Judged by top sommeliers, the awards are overseen by Head of Judging and group wine buyer for restaurant group Hakkasan, Christine Parkinson. Criteria judged are food-friendliness, versatility, typicity, personality – and, importantly, value for money at whatever the price. Judges know the trade prices of each wine as they are judging each flight.